I'm working on a project that'll take me away from the blog for a couple of weeks. If all goes well, I should be back to blogging right around May 15. Until then, Prost! 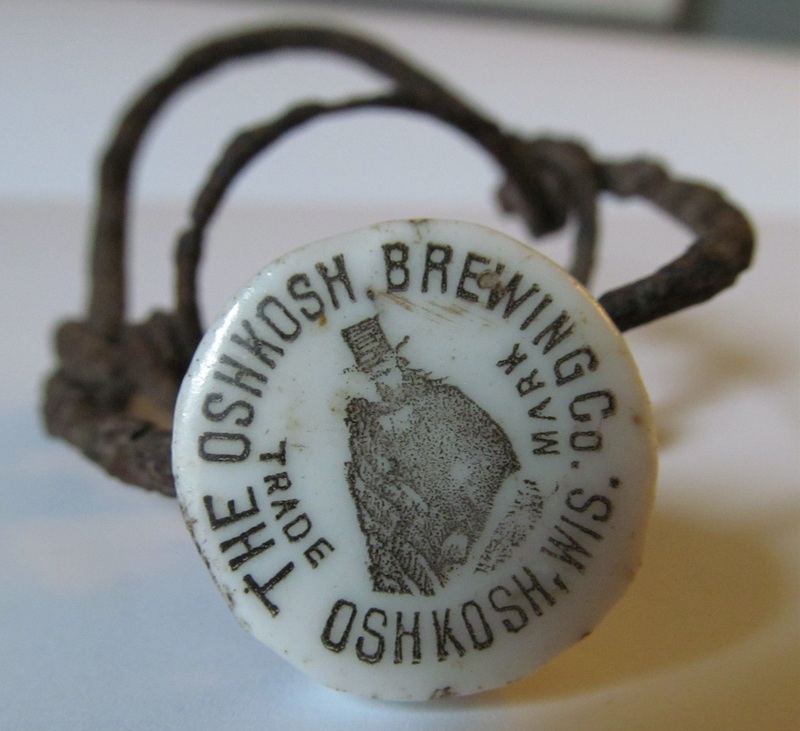 An Oshkosh Brewing Company bottle stopper, circa 1895. Fletch's Local Tap House opens Saturday, May 6 at 570 N. Main St. in downtown Oshkosh. Here's a video introduction to Oshkosh's new craft beer bar. The first saloon at this corner opened in 1875. Over the next 45 years, a stream of barmen flowed through, each calling the place their own. They came and went. Aside from the bar, most of them had one thing in common. They were related, one way or another, to a farmer named Valentine Ruedinger. Valentine Ruedinger emigrated to America from Württemberg, Germany in 1848. He was 19. He was broke. He settled in the Town of Nekimi. Ruedinger went to work farming. He acquired land and a wife. Both were copiously fertile. Before long, the Ruedingers had eight children, 100 acres, and money to spare. In 1865, Ruedinger bought property at what was then Kansas and 8th streets. The lot was positioned on the north end of the “Brooklyn” side of town. Manufacturing concerns, hotels, and rooming houses stood clustered about it. Here's a drawing of that neighborhood circa 1867. 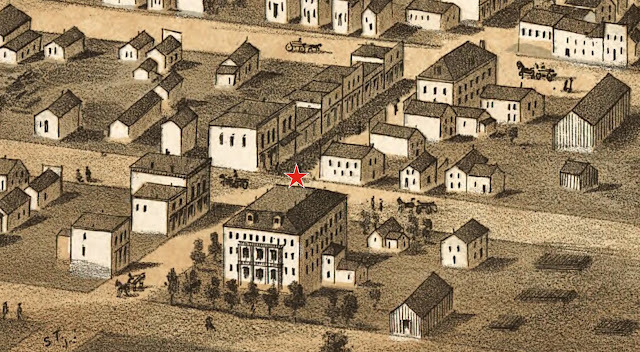 The red star is at the intersection of 8th and Kansas (now S. Main). Joseph Kloeckner was gregarious in the extreme. Born in Germany in 1848, he’d grown up in the hospitality business. The Kloeckner's operated a well-known hotel and winery in Heddesheim. Joe Kloeckner wasn’t interested. He turned 18 and left for America. Kloeckner headed straight for Wisconsin. He hit Oshkosh. He said it was his first love. His second was Valentine Ruedinger’s daughter Anna. They married in the summer of 1875. 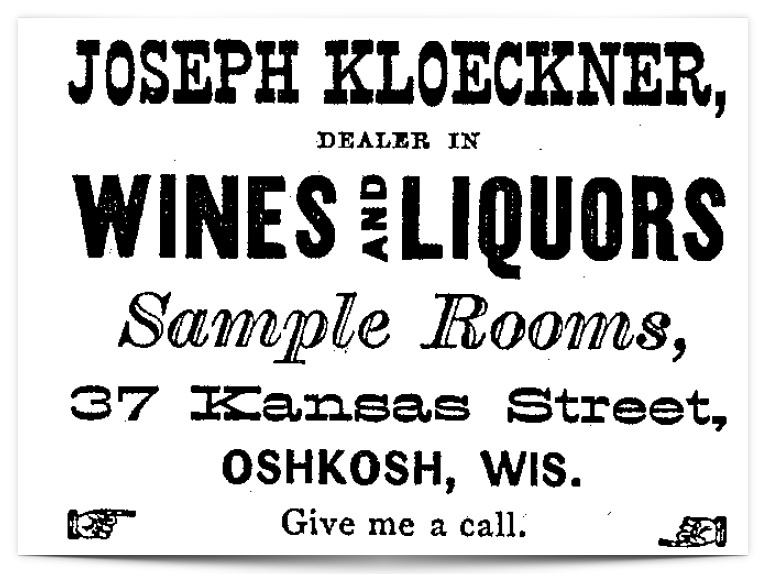 Kloeckner opened the saloon shortly after. He and Anna moved into an apartment above. 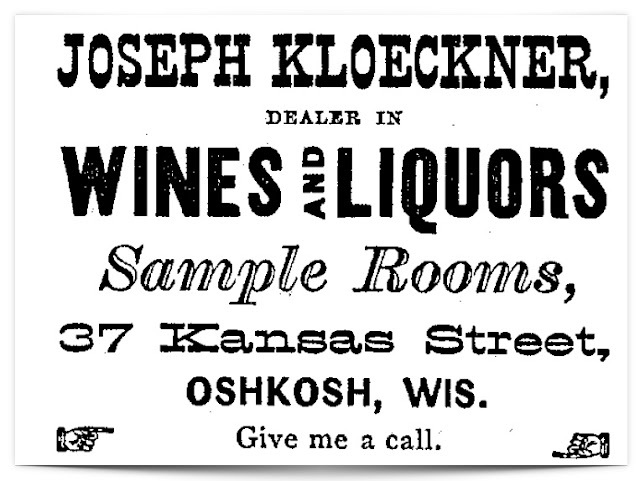 Here’s an ad for the saloon from the 1879 Oshkosh City Directory. The address, however, appears incorrect. All other listings show the address as 49 Kansas St. Call they did. The saloon thrived. Kloeckner made the most of it. Friendships formed over the bar led to business and political opportunities. Kloeckner partnered in a furniture company. He helped launch a bank. Joe’s neighbors elected him alderman of the Third Ward. In 1882, Kloeckner was nominated for a State Assembly seat. One of his backers quipped, "We have got a candidate now who possesses the implements of war — a bar." It wasn't enough. Kloeckner lost the race. But not his momentum. Kloeckner’s ambition outgrew the saloon. 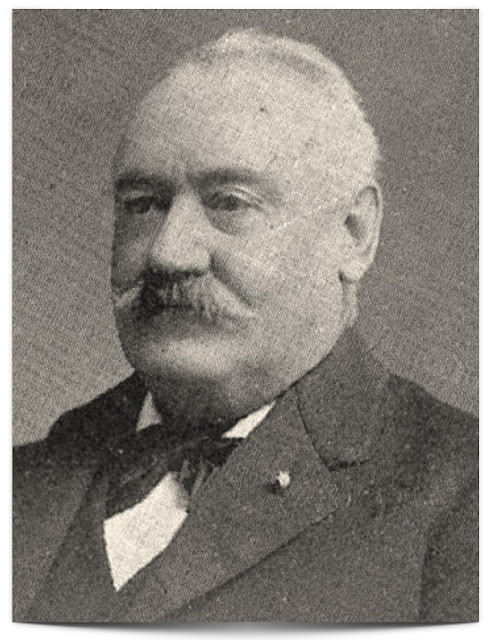 In the fall of 1885, a new deputy revenue collector would be appointed. Kloeckner coveted the post. The saloon would hinder his chances. In April, he sold the bar back to Valentine Ruedinger. Kloeckner got the job he was after. The bar got new proprietors. Valentine Ruedinger’s sons Willie and John took over. It became the Ruedinger Brothers Saloon. The brothers went to town. Literally. They left their farms and moved into apartments above the saloon. "Fresh beer always on tap..." The Ruedinger brothers had an in on that. Brother John married the daughter of Leonhardt Schwalm, co-founder of Horn & Schwalm's Brooklyn Brewery. A good connection for a barman. There was a downside. John August Ruedinger couldn't stop drinking the stuff. His alcoholism flourished at 49 Kansas St. Rocky times were ahead. Insurance map from 1890. 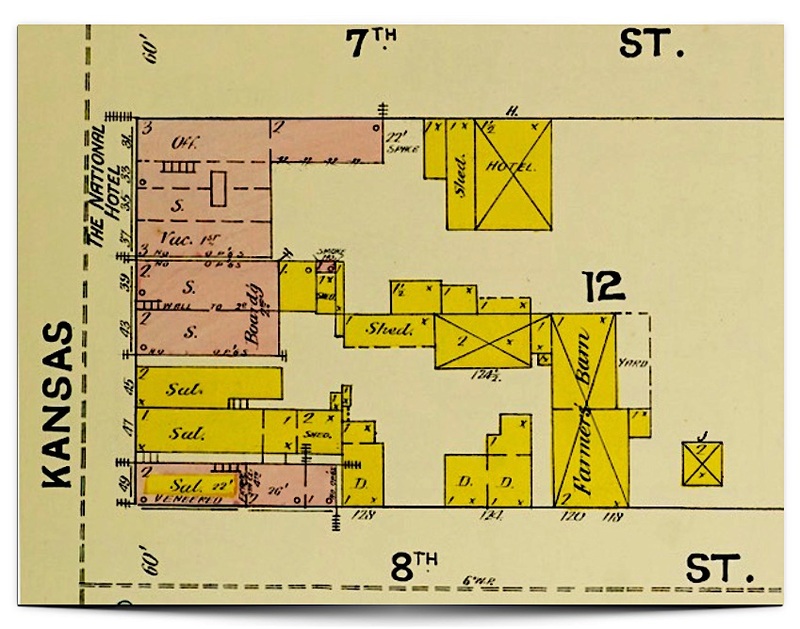 The Saloon is shown at the corner of 8th & Kansas streets. In 1890, the bar was commonly known as the Ruedinger Brothers Saloon. By then, though, the business was a one-man show. John Ruedinger's drink problem worsened. His wife, Henrietta, was headed down the same path. By 1887, they were out of the picture. John and Henrietta returned to their farm in Black Wolf. John's tailspin accelerated. He was placed under guardianship in 1898. He died in 1902. Back at the bar, Willie was running things solo. He had his own ideas. He began selling English-style ales. At the time, locally-brewed lager beer dominated. Porter was not your typical South-Side fare. In 1891, Willie purchased the property from Valentine Ruedinger. Ownership didn't make life any easier. Willie had married a woman from New Glarus named Marie Genal. Her family had been in the hotel business forever. In 1893, Willie and Marie had a son. They named him William August Ruedinger. After the boy was born, their marriage went to hell. Things got ugly. Quick. Willie had borrowed money to purchase the saloon. As the marriage soured, Marie's father, JF Genal, stepped in. He bought the mortgage. It meant Willie was now in debt to an adversary – his father-in-law. The Genal family had Willie boxed in. So he moved out. Marie and William Jr. stayed. Marie’s new boyfriend moved in with them. His name was Peter Reifer. In the old days, the Reifers had been the Ruedinger’s neighbors. They lived in the Town of Nekimi on a farm adjacent to the Ruedinger farm. Peter and Willie had grown up together. Now Peter had Willie's wife, Willie's boy, and Willie's bar. Willie still held the deed, but it hardly mattered. By 1898, the place was known as Peter Reifer's saloon. Marie married Peter Reifer. Willie washed his hands of all of it. He sold the property to Marie. Cheap. He unloaded it for a tenth of what he’d paid for it. The arrangement at the saloon grew fluid. Marie maintained ownership, but from year to year the business was listed under different proprietors. Eventually, another Ruedinger got behind the bar. Willie and Marie's son, William August Ruedinger, took over the saloon in 1914. He had just turned 21. Here's a picture of him at the entrance. He's wearing a white apron. This was taken about the same time he became the proprietor. Did you notice the Oshkosh Brewing Company sign in the background? You couldn't have missed it had you been walking by in 1914. The monochrome photo doesn't do it justice. Here's how it looked in its day, in glorious color. Young William bailed shortly after the 1914 picture was taken. Peter Reifer took over again. In 1916, he put his brother Ben behind the bar. That didn't work out at all. Ben Reifer contracted TB and died. It was straight downhill from there. 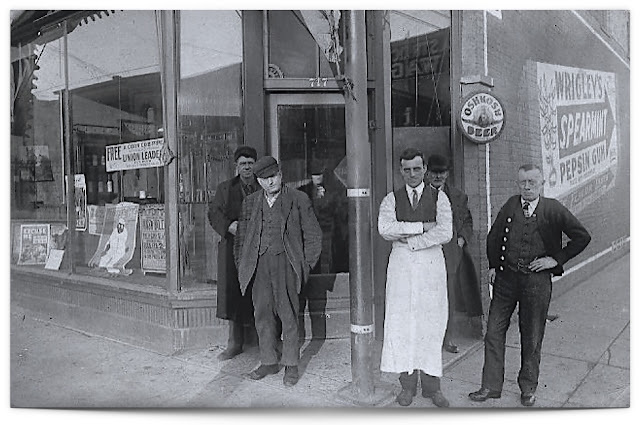 The impending doom of national Prohibition induced the shuddering of countless saloons. The old Ruedinger stand was among them. The building was already vacant when Prohibition hit in 1920. The beer and melodrama were drained from the place. Marie finally sold the building in 1946. She died three years later. The building at 716 S. Main slowly eroded into what is there now. It's held everything from battery shops to the Sacred Circle Spirit Shop, which last offered "metaphysical supplies and services" there in 2009. Did they divine the spirit of a Ruedinger roaming around? 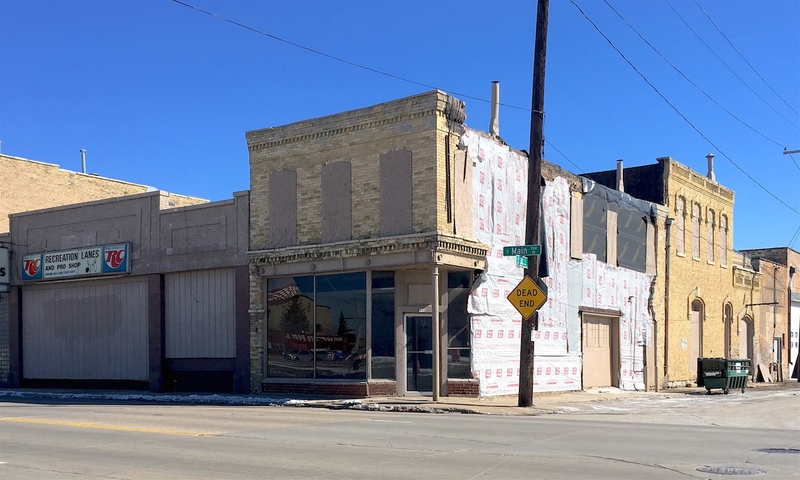 Last December, the property was purchased by the Redevelopment Authority of the City of Oshkosh. It’s only a matter of time. 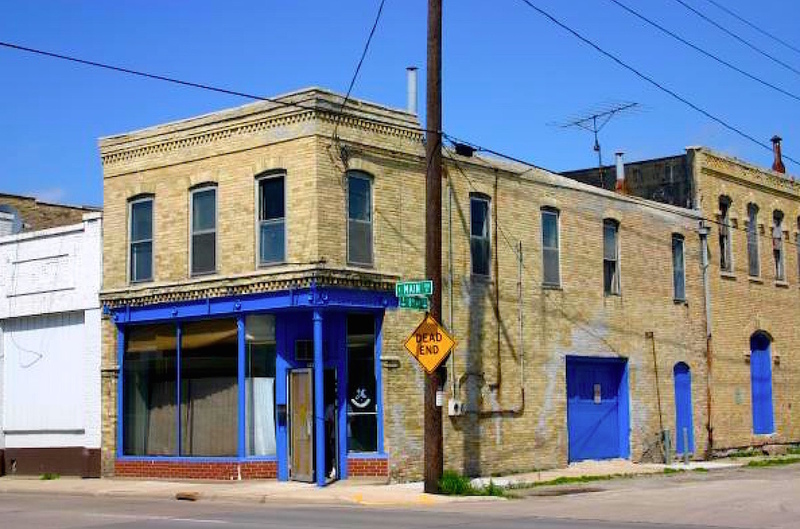 The wrecking ball will soon arrive to pulverize the old Ruedinger saloon. In 1953, The Rahr Brewing Company of Oshkosh produced something rare. The brewery made an all-malt beer. In the 1950s, few American breweries made beer this way. At that time, nearly all American beers were brewed with a significant addition of corn or rice. Here's a bottle of the Rahr's 1953 beer. It was brewed to commemorate the 1953 Oshkosh Centennial. 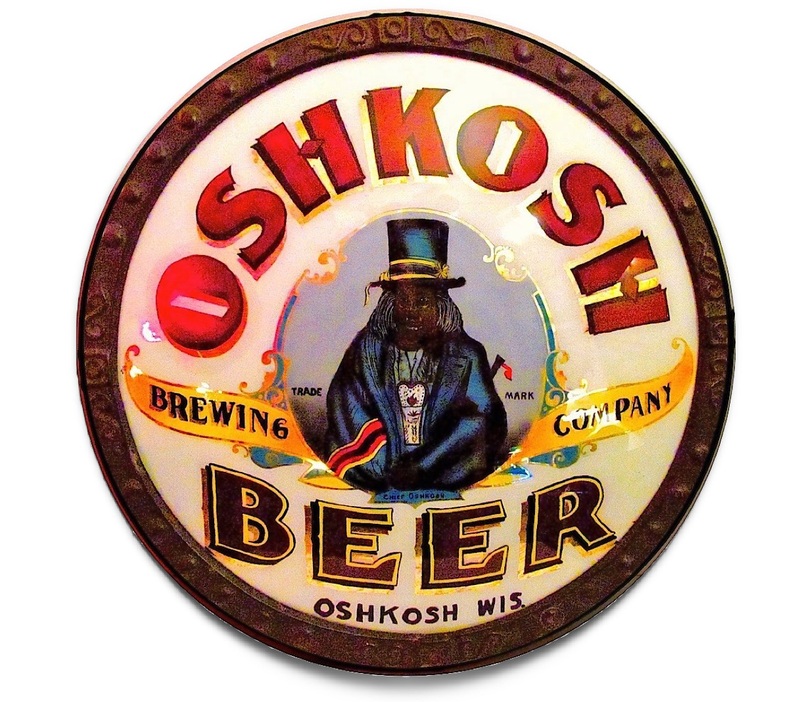 The beer was an homage to the history of brewing in Oshkosh. The Rahr's new that history well. The family had been making beer here since 1865. At that time, every brewery in Oshkosh produced all-malt beers. Corn didn't find its way into Oshkosh's breweries until the 1870s (there's more on that here). But aside from the grain bill, the centennial beer was quite different from beers made in Oshkosh 100 years earlier. Those beers would have been dark. This one, as the label says, was pale. It was the Rahr's version of a Pilsner. Here's the ad introducing Rahr's all-malt Centennial Brew. This is clipped from the Oshkosh Daily Northwestern of June 8, 1953. It's wonderful that an obscure brewery in Oshkosh would be one of the few in America to produce an all-malt beer in the 1950s. I suspect the Rahrs saw this as a kind of last hurrah. By 1953, the brewery was sinking fast. The end was coming. It was only a matter of time. 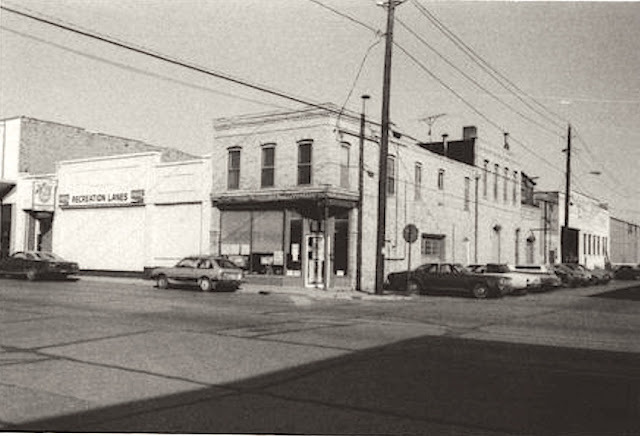 In 1956, Rahr Brewing closed. There wouldn't be another all-malt beer brewed commercially in this city until 1995 when Fox River Brewing Company opened. One last thing. That bottle of Rahr's Beer at the top of this post belongs to a friend of mine. His name is Grant Peterson. Grant used to be a delivery driver for Peoples Brewing Company. He showed me that bottle the other day at Oblio's. When I was admiring his bottle, it struck me that here we have a former driver for Peoples with an old bottle of Rahr's in a tavern that was a tied to Schlitz. This city is wrapped in a web of beer. Repp’s Bar is the epitome of the family-owned, neighborhood tavern in Oshkosh. Al Repp has been behind the bar there for more than 50 years. He’s an Oshkosh treasure. In this video, Al Repp tells the story of his bar and what life was like on the “West Side” of Oshkosh. When legal beer returned on this day in 1933, people in Oshkosh took it in stride. Probably because beer never went away here. During the dry years, Oshkosh was flooded with homebrew and beer from illegal “wildcat” breweries. The article below is from the Oshkosh Daily Northwestern of April 7, 1933. It recaps the mild, midnight celebration that took place in Oshkosh. Last week, I blogged about the the Sitter family's early years in Oshkosh and the wildcat brewery they operated during Prohibition. You can find that story here. Today we head back to Sitter Beverage, which was located at what is now 1255 Harney Ave.
We pick up in the spring of 1933… It was a happy time in Oshkosh. There was sense of anticipation. National Prohibition was coming undone. Legal beer was coming back. On March 22, President Roosevelt signed off on legislation clearing the way for beer that was 4% ABV or less. That same evening, Matt Sitter ran an ad in the Daily Northwestern urging people to send him their orders. Oshkosh Daily Northwestern; March 22, 1933. The Sitters were back in the beer business. Bonafide. But there was a hitch. Oshkosh’s three breweries were already swamped with orders for beer. Matt Sitter had to scramble to find an out-of-town source. We get the story from a relative of Matt Sitter. "In 1982, I was at work and a customer stopped by. He asked if I was related to Matt. He was the driver of the first load of beer to come to Oshkosh for Matt for the day Prohibition ended. I wish I could remember his name and what brand. He said everything was going fine with his trip back from Milwaukee. He approached the Main Street bridge from the South and as he crossed the river he almost crapped his pants. Both sides of the street were lined with people waiting for the first loads of beer to arrive (I can only think of the song “Happy Days are Here Again!”). It scared him so much that he was happy that his first turn was to go down Ceape Street. He got to Harney Avenue and was instructed to back the truck up the narrow driveway to unload. As he was backing up someone yelled out to him “stop, stop, you are going to snap the wire”. It was a wire for the telephone. At that point Matt Sitter yelled out, 'That beer is worth more than any G** Damn wire, get that truck back here to unload!'" And so, Matt Sitter had his beer. In the future, he wouldn’t have to hustle so to get it. After the initial furor waned, Sitter partnered with Peoples Brewing Company. 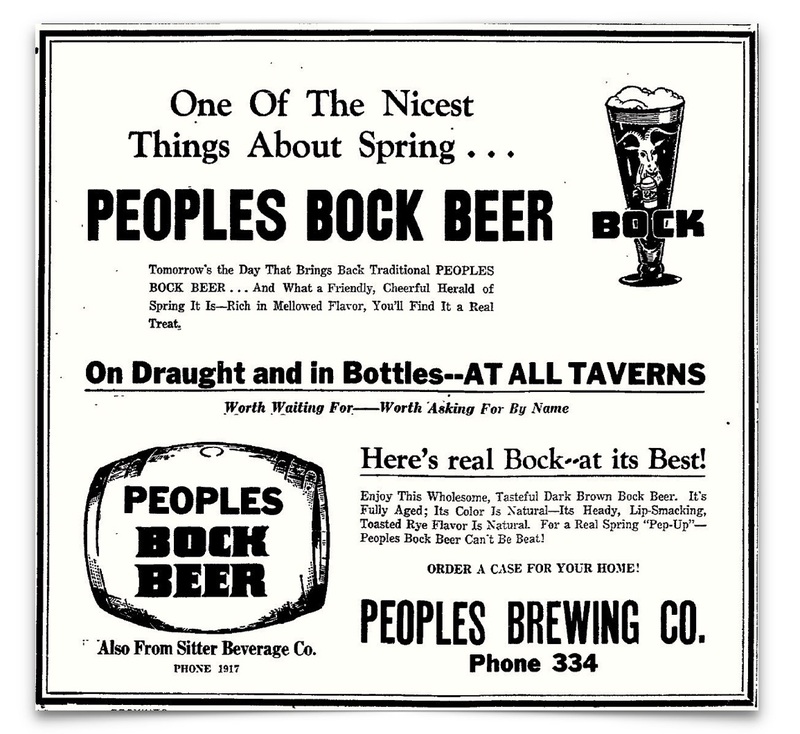 Sitter Beverage became the primary distributor for Peoples Beer in the Oshkosh area. Matt Sitter expanded the family business beyond beer. He began offering, wines, cordials, whiskey. 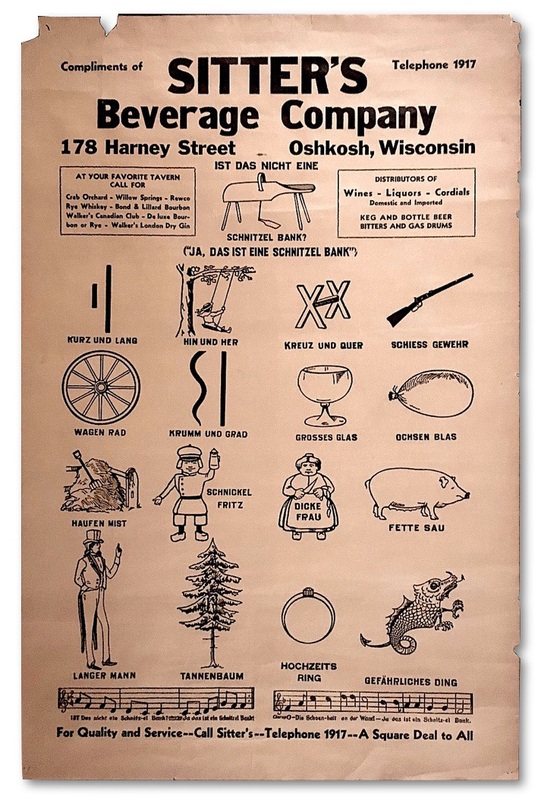 Here’s the head of a December 23, 1933, advertisement celebrating the Sitter family’s 50 years in Oshkosh. 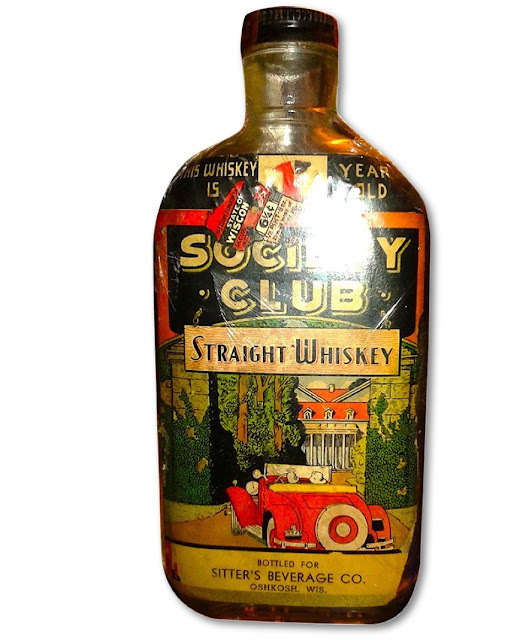 And here’s a mid-1930s whiskey bottle from Sitter Beverage. Sitter’s advertising sometimes paid homage to his family’s European roots. The example below comes in the form of a "Schnitzelbank" poster. Schnitzelbank is an old, call-and-response German song. It was popular among the German immigrants who came to America in the latter half of the 1800s. Schnitzelbank was often sung while drinking beer. If you want to grab a beer and sing along, here’s how it’s done (and here's another example). Here's another copy of the poster. 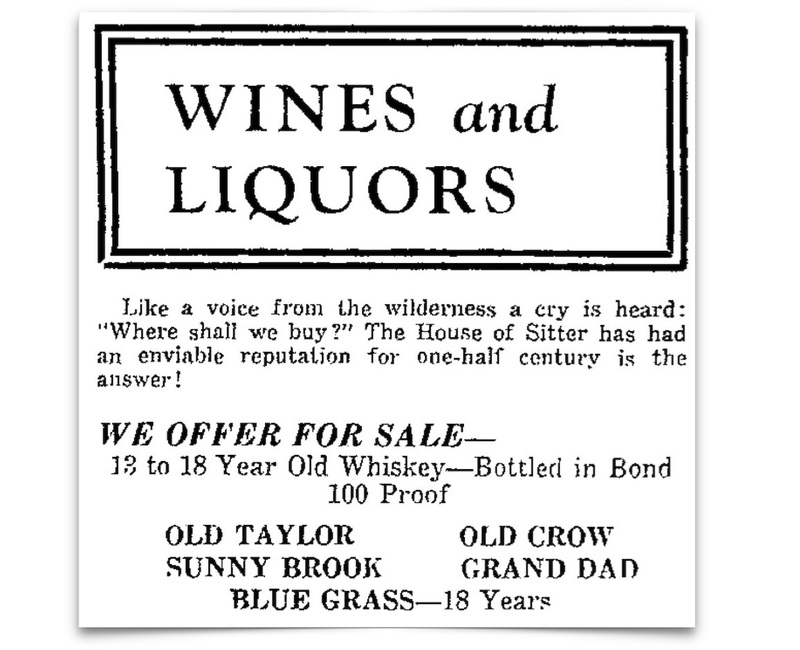 Sitter Beverage flourished in the years following the repeal of Prohibition. But Matt Sitter’s success was cut tragically short. He died of stomach cancer in 1940. By 1948, Sitter Beverage had closed. Mathius Sitter is buried in Oshkosh’s Riverside Cemetery. Thanks to Tom Sitter, he's been a great help with this. Tom gets the last word. "Here is the link for Bernhard Sitter and his Bier Hotel at Gut Riedelsbach. It is 8 to 12 miles from my Great Grandfather’s (Johann Sitter's) birthplace, which is now in the Czech Republic (Formerly in Austria). His birthplace was Boehmischroehren, Austria. If his last name is Sitter, and he makes and likes beer, I know he is a direct descendant!!"